Please send only JPEG image files. Attach the image files to your email. Include detailed instructions as to print sizes and quantities you want for each file name. Specify the paper surface you desire--Matte or Glossy. If you do not specify a surface, we print on Matte paper. Include your daytime telephone number so we can contact you if there are questions about your order. We will send an email reply indicating when your prints will be ready. Email orders are printed during daytime hours Monday through Friday, unless you have made prior arrangements with us. One-day service time is standard for orders to be picked up in our store. Orders may be shipped directly to you for $3.50 per shipment, after credit card or other payment has been received via telephone, fax or mail. For your security, please do not include credit card information in your emails. Please contact us with any questions or concerns. 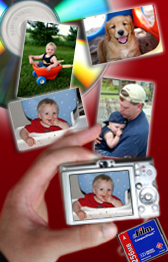 Click here to email your digital image files to our Saint Cloud photo lab (downtown). Click here to email your digital image files to our Waite Park photo lab (north of Crossroads Shopping Center).